With a smile on his face and a small chuckle, Ryan Bhat said he was pleasantly surprised to receive an Australian Tertiary Admission Rank (ATAR) of 99.9. The impressive score made him the Dux at Goulburn Valley Grammar School for 2018 and was the highest scoring ATAR in Greater Shepparton for the year. With a score like his most would expect a career in law, medicine or something of the like, however Ryan said he would follow his true passion: music. “It’s so funny because people say I’ve got the highest ATAR score and I’m doing the course that doesn’t need an ATAR score to get into,” he said. With his secondary school years behind him, Ryan said he was looking forward to beginning a Bachelor of Music at Melbourne University and seeing where his love for percussion could take him. While some may have been nervously awaiting their ATAR results at 7am on the morning they were released, it seemed Ryan was the complete opposite. Waking up at 9am, he made himself a cup of tea and breakfast, beginning his day as normal before heading to his computer to check his score. “I didn’t feel like checking it first thing when I woke up, I thought I’d rather do the things I normally do in the morning and then do it,” he said. Ryan is the youngest son of Ravi, a psychiatrist, and Yasmin, a psychologist. Ryan’s older brother Aaron graduated Year 12 four years ago, also becoming the Dux of his year level at Goulburn Valley Grammar. Aaron has since completed a science degree and is now enrolled in Medicine at Melbourne University. Ryan said his brother was very happy to hear the news of his result. “Aaron was the Dux of his year level too, he was very pleased when I told him the news,” Ryan said. Ryan studied English, Music Performance, Specialist Maths, Maths Methods, Chemistry and completed Indonesian in Year 11. He said he loved all of his subjects, which made it easier for him to maintain focus and continue his studies throughout the year. While the pressures of Year 12 can become overwhelming at times, Ryan said he never set himself a strict schedule. Rather he prioritised his time around work that was due, and always managed to squeeze in a session or two for music. “I didn’t have that much of a fixed routine I sort of did what I felt like and then I’d go and play the marimba,” he said. It seems Ryan’s laid-back attitude was something he maintained throughout Year 12, with his mum admitting at times she felt more stressed than her son. 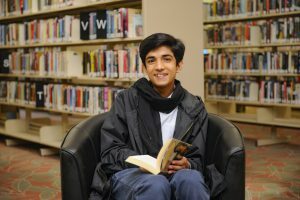 Mrs Bhat said Ryan ensured he maintained his love of reading and music during the year, spending many hours cooped up in a corner of the Shepparton library engulfed in a new book. “I think Ryan did not stress at all, he did a lot of other things as well like with his music he wasn’t just studying which is what I think kept him relaxed,” she said. During the year Ryan was recognised for his percussion skills, coming first in his age category at the Australian Marimba Competition in Melbourne. Up against talented secondary and university level students, Ryan said it was very exciting to win and stood as a highlight of his year. A keen member of Goulburn Valley Concert Orchestra, Ryan dedicated every Thursday night to rehearsals along with regularly traveling to Melbourne to have lessons with a private percussion teacher. For four years Ryan also played in the school’s production orchestra, spending many nights down in the stage pit doing what he loved. Outside of music, he also thoroughly enjoyed debating which he took part in each year with his friends. Starting at Goulburn Valley Grammar in Year 5, Ryan said he made some great friends and met some amazing teachers along the way. Moving from St Lukes in Shepparton he said the transition was made easier by the welcoming nature of everyone at the school. When asked if he had a favourite teacher he admitted he could not single out just one, but thought he was lucky to have had a great selection over the years. “This year in particular all my teachers were great, I’m very happy with that because they were all very helpful, very nice and gave me lots of opportunities,” he said. Looking back on the past eight years, Ryan said he had made some great memories and was sad to see this chapter of his life come to a close. He wished the future Year 12’s good luck with their studies and encouraged them to work hard, stay focused but most importantly enjoy their time at the school. “Do the things you enjoy doing and do your best, if you work hard then you’ll do well,” he said.